Hey, remember Debbie Goard of San Francisco’s Debbie Does Cakes? The preternaturally-talented woman responsible for the awesome Optimus Prime cake and wicked Millennium Falcon cake you’ve seen here on GWS? Well, this time she spent eight hours crafting fondant and vanilla pound cake with chocolate buttercream filling into the 17″-tall likeness of everyone geek’s favorite droid. Can R2 units get conjunctivitis? This particular cake was for a young boy in Cupertino, Sam, who greeted me and the cake wearing a STAR SAM shirt done in the Star Wars font. So cute! Yeah, that’s cute, alright. Right up until a team of LucasFilm attorneys come knocking on Sam’s door, threatening litigation unless Sam’s folks cough up a licensing fee. I hope you enjoy your shirt while you can, Sam, because it just cost you a college education. This is the third cake for Sam and his brother. The first was a 3D Pikachu, then another Pokemon-themed cake featuring an edible Dialga figure and pokeball cake. Unfortunately, I don’t have any Ritalin-filled nine-year-olds handy to translate for me, so I have no idea what you just said. But I’m sure the cakes were completely impressive. And grotesquely yellow, if I know anything at all about Pokemon. What say you? Does this top the previously-featured and -adulated R2-D2 groom’s cake? The Pikachu cake is an abomination. What would that cake look like? A stack of #2 pencils? Yawn. Wow! I know where I’m going to get a cake for my son’s birthday this year! If she can create something this fabulous, I know she can create a…guitar…or a train. In her sleep, even. P.S. GreatWhiteSnark: Just noticing your “Find Me Online” section. Wow. You’re everywhere! The detail on this thing is amazing! 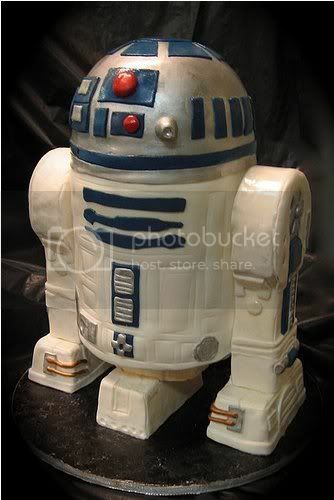 Definitely beats the other R2D2 cake, which is also awesome. Sam, you are one lucky kid.